Girls pink bib overalls can be dressy or casual, and the variety of designs can make them appropriate for toddler girls up to tweens. 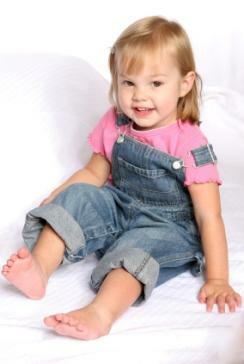 If you are in the market for girls pink bib overalls, consider the fit, material, and style you prefer before you buy. There are numerous styles and designs to choose from, and girls of all ages love overalls! How important is fit when it comes to overalls? Actually, overalls can go from comfy to constricting if you purchase an ill-fitting pair. Probably the most important area to consider when fitting your girl for a pair of overalls is the measurement of the stride. In other words, overalls that are too short in the body can be very uncomfortable. One of the best features about a pair of overalls, however, is the fact that they provide some leeway for adjustment. With this in mind, be sure you purchase overalls with plenty of room to tighten the straps as your child grows. Don't purchase overalls that are already lengthened as much as possible. This won't allow for much, if any, growth, and you'll find yourself replacing the overalls very shortly! Overalls don't just come in denim material. In fact, you can purchase overalls in a variety of materials, from corduroy to seersucker and more. Seasonal purchases often play a role in the type of material needed. For example, if you are in need of warmer clothing for your child, then look for thicker materials, such as heavy-duty denim or brushed or ribbed corduroy. For the warmer months, look for overalls constructed from lighter weight materials, such as 100 percent cotton, seersucker, or even cotton/polyester blends. Today's overalls aren't designed with your grandfather's overalls in mind! You can go for the feminine, even dressy, look or fulfill your daughter's secret desire to be a tomboy. If feminine and fun are what you're shooting for, then girls pink bib overalls are the perfect answer. The color lends itself to what girls are all about, but there are still lots of designs and patterns to choose from. Designs-Overalls are so versatile. They come in long pants, shorts, or even skirt designs. Overalls that are actually one-piece pants and top outfits are typically referred to as "coveralls", and while they might not be what you are searching for, there are a variety of these on the market as well. Patterns-You can stick to solid colors or look for fun and funky patterns. From flowers to polka dots, and even stars and stripes, the patterns and colors that are available in overall styles are numerous. Functionality-Just how functional do you want the overalls you purchase to be? Do you want lots of pockets and plenty of places to adjust the fit? Or, do you want overalls that offer simple lines without all the additional features? For baby girls, the second choice might be your best bet for comfort and care. For an older girl, however, overalls with lots of pockets and hidden storage areas may be just what she needs. Durability-In most cases, your child will outgrow her overalls before they have a chance to wear out, but that doesn't mean you shouldn't pay attention to how durable they are. Because overalls are one piece, they often tend to pull in different stressed areas, such as the stride and the straps. As you examine the overalls, look for double stitching around these areas in particular. Where can you find a great selection of overalls for your girl? Kids' Specialty Stores-Check out specialty stores, such as Kids R Us and Gymboree, as well as the Children's Place. Department stores-Department stores like Wal-Mart, Target, and J.C. Penney often have a great selection. Do-It-Yourself-Finally, if you know how to sew, then grab a pattern, purchase some material, and sew a pair or two of overalls. This is a perfect way to customize the fit as well!